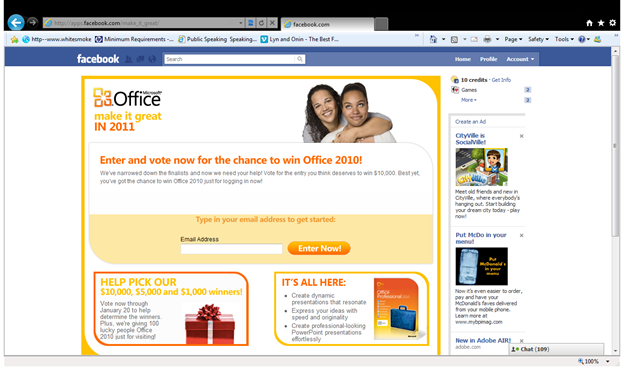 Vote & Win Microsoft Office 2010! Hello guys! I need your help to make it possible this 2011. Just follow the link and steps below, vote for "In 5 Slides" entry. 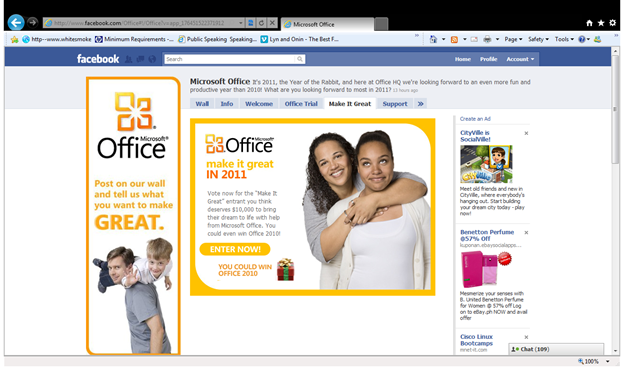 PLUS, get a chance to be one of the 100 lucky people winning MS Office 2010! Each individual may vote one (1) time per day using a valid email address. TAKE NOTE ONE VOTE PER DAY ONLY. multiple email addresses from one user are not allowed. Multiple voters are not permitted to share the same email address. 3. Click ENTER NOW button. 7. Finally, Click Vote for this Entry. Make It Great, Make It a Habit and help me to Make It Possible this 2011. Thank you so much for your support and God Bless Everyone! You can also download my prezo from the link, and explore how Office 2010 Makes It Great in making my entry, using the new features of PowerPoint 2010 . This entry was posted on Friday, January 7th, 2011 at 1:16 pm	and posted in Contests, PowerPoint. You can follow any responses to this entry through the RSS 2.0 feed. i’m having troubles voting for make it great contest. 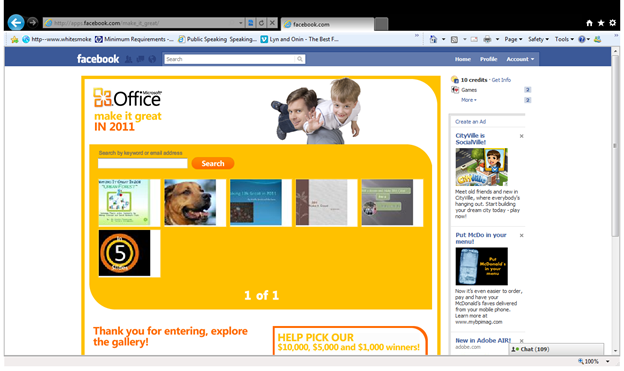 after i click on the enter button and my email add, i don’t see any view gallery to vote in so i can’t submit my vote. awe, others have the same problem, have you tried visiting the page again? 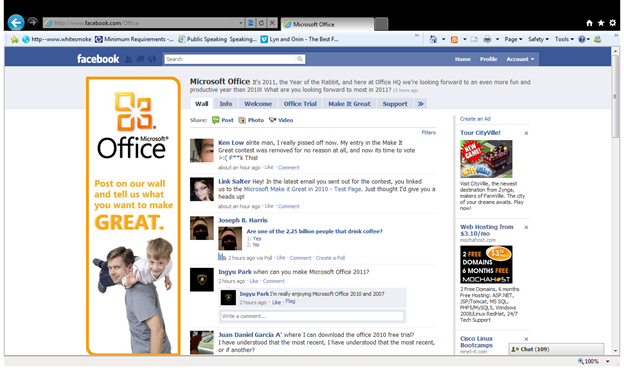 i think there’s a problem with the facebook apps. guD luck Puh kua aStig..!!! Yeah! God bless you in your entry! Why don’t you save it as video instead of using screen recorder software? I see your mouse pointer, dont lie… Hahaha! That would save you from your video being lagged all the time. Hahaha! Hello John, First of all, that’s a very good observation. yup i know i can save it as a video directly using PowerPoint.That’s was my first plan to create the video. yup i won’t lie, i used a screen recorder software. However i inserted a video directly from YouTube from the fourth slide. that was my problem, it keeps on prompting a dialog box. i followed the instruction but the optimize compatibility is not available for usage. any idea how to do it the right way, to solve the problem? Is your YouTube video encoded properly for Windows? If so, yes it is encoded from “.mp4, .flv, or etc.” to “.wmv”. However, some av converter softwares doesn’t really encoded it properly. So if this is the problem, it should be resolved. If not, call an expert. I’m not expert though, just a wanna be.